We have grave concerns about the contents of the Aquaculture Activities Regulations, particularly the emphasis on aquaculture industry self-monitoring and regulation. Business leaders, commercial and recreational fishing associations, scientists, lawyers and environmentalists are calling on Prime Minister Harper to halt the implementation of the proposed Aquaculture Activities Regulations. The changes will exempt the aquaculture industry from the Fisheries Act provisions that “prohibit the release of deleterious substances into water frequented by fish.” Despite broad based opposition since the beginning of the regulatory change process, which started in 2011, the government of Canada has moved ahead in implementing these changes. 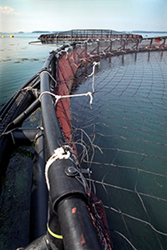 The 120 signatories of an open letter sent today, contend that the proposed changes will lead to increased environmental risk through the discharge of increasingly powerful pesticides, and other potentially damaging substances into the aquatic ecosystem, significantly reduce government regulatory oversight, and damage Canada’s commercial interests as a provider of untainted seafood. “We have been fishing along side the aquaculture industry for decades and we know the impacts open-pen salmon farms can have on the traditional fishery. When the salmon aquaculture industry is poorly regulated it places our industry and livelihoods in jeopardy. We have grave concerns about the contents of the Aquaculture Activities Regulations, particularly the emphasis on aquaculture industry self-monitoring and regulation, and the capacity of DFO to enforce the proposed regulations,” says Maria Recchia, Executive Director of Fundy North Fisherman’s Association based in Southwestern New Brunswick. A newly released scientific study by the Department of Fisheries and Oceans, (Research Document 2014/002, A review of potential environmental risks associated with the use of pesticides to treat Atlantic salmon against infestations of sea lice in Canada, L.E. Burridge and J.L. Van Geest, http://www.dfo-mpo.gc.ca/Csas-sccs/publications/resdocs-docrech/2014/2014_002-eng.pdf) on the impacts of two pesticides used to treat sea lice, Salmonsan and Alphamax, shows that there are lethal effects on lobster and the risk from one of those, Alphamax, exists up to ten kilometres from sites of use and concludes that there is a general lack of data on pesticide impacts on a wide variety of other marine species. Consultations were held starting in 2011 on proposed changes to the Fisheries Act regarding treatment of sealice in the open net pen finfish farming industry. Proposed regulations were published in the Canada Gazette on August 23rd, 2014.